Some new years bring with them just a change of numbers – other new years bring bigger changes. 2013 seems to be of the later categories. At least if you consider moving to a different country a change. Starting from later this January, I will exchange my Copenhagen address for an address in Bonn, Germany. I guess you could claim that I’ll start a new life as a Bonn-girl. I have on previous occasions moved abroad to take on new jobs (in China, Switzerland and Japan) but this time no fixed job awaits me. Rather, I have the opportunity to explore different options, try out my freelance skills and at the same time live with the person dearest to my heart. I must admit that I know very little about Bonn. Both in general but also when it comes to the activities in science communication and in public health. Actually, I know very little about the status of science communication in Germany in general. However, since I plan to stay in the field of Public Health Science Communication, which I find to be both super interesting and a an important topic for public health, I truly can say that look forward to exploring it. Apart from finding out what goes on in Science Communication in Germany, I still plan to have my feet planted into Danish Public Health Science Communication – as well as into global Public Health Science Communication. One of the wonders of social media (and the internet in general) is that it really doesn’t matter where you are – you are free to work and stay connected with the entire world. So far I haven’t got a clear-cut plan for my Bonn life, but lots of ideas, already a few assignments and a long list of opportunities. Bonn is a UN-city with a bunch of UN agencies present, so it is likely that I can engage with them. Especially due to the fact that I have experiences working with them already. The United Nations University is located in Bonn and several German Universities are close by (Bonn University, University of Cologne to mention a few) as well as a number of international NGOs and other organisations are based in Bonn. If they are not already working on science communication and social media then there is certainly a lot of new ground to made there! Should any reader of this blog know of relevant people to in Germany to engage with, Institutions working on science communication and social media, University courses related to science communication etc. please don’t hold back. I’d love to hear about it. I promise to keep you all on posted on my doings in Public Health Science Communication in Bonn and in the rest of the world. So far assignments with the Department of Public Health, Medical Museion, and the Faculty of Health and Medical Sciences at University Copenhagen will take up my time as will communication assignments with the European Regional Office of the World Health Organisation (WHO). I would also love to explore opportunities for continuing teaching Public Health Science Communication. Perhaps the course Public Health Science Communication which I taught last year at University of Copenhagen can be adapted to other universities…. Anyhow, with this first blog post of 2013 I would like to wish you all a Happy New Year where ever you are based. Bonn adventures awaits and I look forward to you being a part of them. If not in any other ways, then by following my scribbles here on this blog. Why should we do public health science if we can’t communicate it? 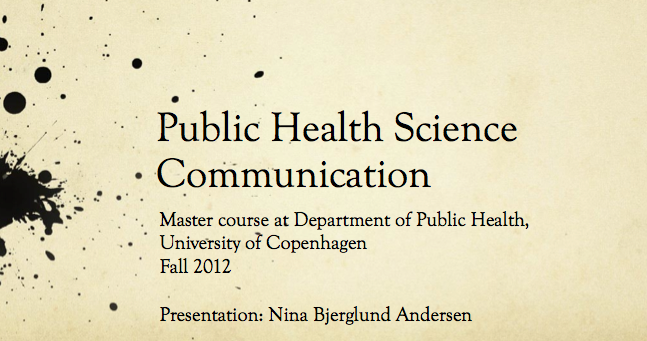 The course Public Health Science Communication went live Wednesday last week! And based on the first experiences it survived the encounter with the students, is still in good shape and looking forward to moving on to module two this coming Wednesday. In one sentences: What is public health science communication? That it is important – why should we do public health science if we can’t communicate it? Most of the responses are not surprising, and combining them gets us around several aspects of the concept. I do however still find it a little surprising that focus is so heavily on communicating to the public. Where is communication with researchers? Only a few mention e.g. policymakers and public health practitioners. Of course the word public could be understood in its broadest sense – but my feeling is that many are thinking about Mr and Mrs Smith/Jensen/Sanchez when they say “the public”. Some also understood public health science communication to be communicating for behavioral change, which would probably fall more under health communication. Secondly, it seems that science communication is regarded as being about communicating to the public and not with the public. I look forward to expanding the students’ perception of this in the coming weeks. All the responses are interesting, but my favorite response is this one: “That it is important – why should we do public health science if we can’t communicate it?” In my head it nails it completely. I’m exited about what the responses. Hopefully, the students will feel that they have been given a few tools, and a better understanding of the role of science communication in public health when the course is over. I also hope that they will have seen that public health science communication includes more than reaching the public and ‘selling messages’, but is just as much about engaging and interacting with the public (understood in its broadest sense) and that communication is not only in aimed at educating the public but may also serve a purpose for their research and for themselves as researchers. Although the students’ expectations and the objective of the course weren’t all that different I still clarified what the course was not – and what it was intending to be. Perhaps this may be useful to readers on this blog as well. The report is based on a survey of 1.060 American adults and 124 health care executives. Social media “likes” healthcare. This is the title of a recently launched report from PwC’s Health Research Institute (HRI). The subtitle; From marketing to social business, reveals that the report is focused on the role of social media in health care business. 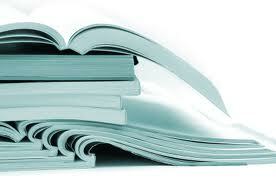 It does however have some interesting findings which are relevant also seen from a science communication perspective. From PwC’s website the report including the statistical findings can be downloaded, so I won’t refer them here, but just highlight a points which could be useful in public health science communication. According to the report it is clear that social media is a tool for the public when they need health information. The figure below illustrates this. I would argue that this goes for public health science communication too. If the consumers doesn’t find your research while searching social media they will just find something else. Social media is out there and people are using it whether you like it or not. 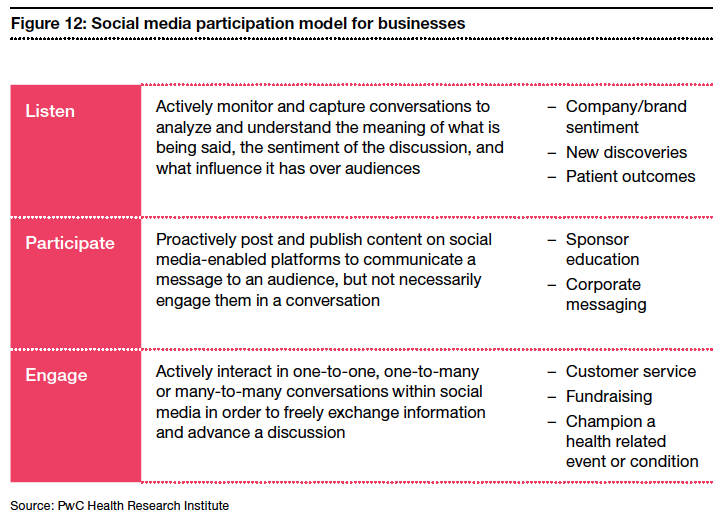 Although the report focuses on how social media can be used in marketing and in social business strategies, HRI’s suggested social media participation model for businesses does hold some useful tips relevant also for science communication. The Listen, Participate, Engage strategy is illustrated below. Looking at the strategy with science communication eyes this could be a good starting point for scientists who are newcomers to social media. Listening is to start knowing. Looking into what other research organisations are communicating, what patient associations are focusing on, what colleagues already on social media are writing about can be a way to get a feel for the media and how it works. And it is pretty risk free – it is about listening and learning. Second step is to participate. Start sending out tweets or post links to your own articles on Facebook. Retweet others links. There is no need to actively engage or go into discussions, but being active can give a feel of what happens when you communicate. Third step is then to start engaging. From my experience it is not a process that is strictly divided into phases but something that slowly progresses. All of the sudden it makes sense to comment on a blog post, to ask a question on Twitter or respond to a statement on Facebook. It is also a process to find out what kind of social media that works best for the individual. Slowly moving from listening, to participating and then engaging makes it clear that the different platforms offers different functionalities and that which ones are most useful varies between scientific disciplines, organisations, countries etc. All in all very simple steps and nothing fancy, but it doesn’t always have to be so complicated. Again, the report from HRI is focused on health care business and not on health sciences. It would be interesting to do a similar or extended survey including questions on scientific health information and interviewing research institutions about their use of social media. 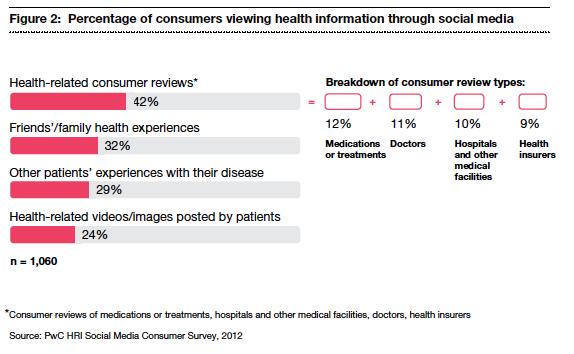 I do believe however that some of the findings from the consumer survey in this report, which indicates that social media is playing an increasingly significant role in health care, also applies to health sciences and that public health researchers who are not already trying out the media should start to listen, participate and engage.